(Nanowerk News) One of the most instantly recognizable features of glass is the way it reflects light. But a new way of creating surface textures on glass, developed by researchers at MIT, virtually eliminates reflections, producing glass that is almost unrecognizable because of its absence of glare — and whose surface causes water droplets to bounce right off, like tiny rubber balls. 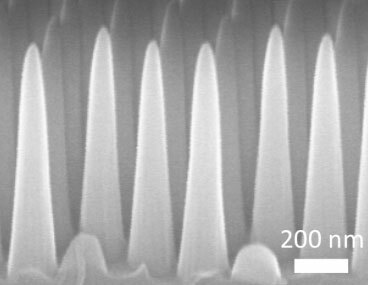 The new "multifunctional" glass, based on surface nanotextures that produce an array of conical features, is self-cleaning and resists fogging and glare, the researchers say. Ultimately, they hope it can be made using an inexpensive manufacturing process that could be applied to optical devices, the screens of smartphones and televisions, solar panels, car windshields and even windows in buildings. The technology is described in a paper published in the journal ACS Nano ("Nanotextured Silica Surfaces with Robust Super-Hydrophobicity and Omnidirectional Broadband Super-Transmissivity"), co-authored by mechanical engineering graduate students Kyoo-Chul Park and Hyungryul Choi, former postdoc Chih-Hao Chang SM '04, PhD '08 (now at North Carolina State University), chemical engineering professor Robert Cohen, and mechanical engineering professors Gareth McKinley and George Barbastathis. Photovoltaic panels, Park explains, can lose as much as 40 percent of their efficiency within six months as dust and dirt accumulate on their surfaces. But a solar panel protected by the new self-cleaning glass, he says, would have much less of a problem. In addition, the panel would be more efficient because more light would be transmitted through its surface, instead of being reflected away — especially when the sun's rays are inclined at a sharp angle to the panel. At such times, such as early mornings and late afternoons, conventional glass might reflect away more than 50 percent of the light, whereas an anti-reflection surface would reduce the reflection to a negligible level. Other applications could include optical devices such as microscopes and cameras to be used in humid environments, where both the antireflective and anti-fogging capabilities could be useful. In touch-screen devices, the glass would not only eliminate reflections, but would also resist contamination by sweat. Ultimately, if the cost of such glass can be lowered sufficiently, even car windows could benefit, Choi says, cleaning themselves of dirt and grit on the exterior surface of the windows, eliminating glare and reflections that can impair visibility, and preventing fogging on the interior surface. Since it is the shape of the nanotextured surface — rather than any particular method of achieving that shape — that provides the unique characteristics, Park and Choi say that in the future glass or transparent polymer films might be manufactured with such surface features simply by passing them through a pair of textured rollers while still partially molten; such a process would add minimally to the cost of manufacture. Andrew Parker, a senior visiting research fellow at Oxford University's Green Templeton College in the U.K. who was not involved in this work, says, "Multifunctional surfaces in animals and plants are common. For the first time, as far as I am aware, this paper learns a lesson in manufacturing efficiency from nature by making an optimized antireflective and anti-fogging device. … This is the way that nature works, and may well be the future of a greener engineering where two structures, and two manufacturing processes, are replaced by one." The research was funded by the Army Research Office through MIT's Institute for Soldier Nanotechnology; the Air Force Office of Scientific Research; Singapore's National Research Foundation through the Singapore-MIT Alliance for Research and Technology (SMART) Centre, and the Xerox Foundation. Park and Choi are recipients of fellowships from Samsung and the Kwanjeong Educational Foundation/STX Scholarship Foundation, respectively.